National Development Bank (NDB) on Friday announced key changes, including a new Chairman as well as the exit of its CEO/Director, with some linking the developments to the loss of independence while others claim they aren’t related. Ending much speculation as well as inside drama over who will be the Chairman at NDB, the bank announced that senior banker Ananda Atukorala has been appointed to the Board and Chairman subject to the approval of the Central Bank. For this appointment, Atukorala quit the DFCC Board which he was serving on since April 2015. His appointment follows the retirement of N.G. 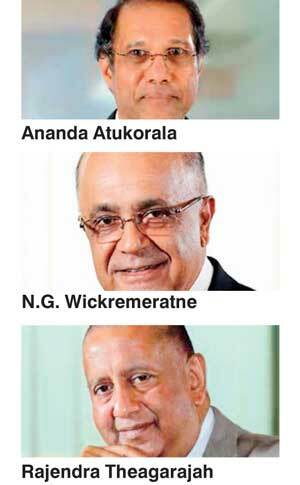 (Tanky) Wickremeratne as NDB Chairman from 30 August 2016 after being appointed in April 2015. The former Hayleys Chairman was retiring from the NDB Board before reaching the age of 70. There had been tussles within the NDB Board and outside over the new Chairmanship. Among the names that are being speculated as contenders or those being promoted by some shareholders were Indrani Sugathadasa, who has been on the NDB Board since 4 October 2013 and Kimarli Fernando, who has been on the NDB Board since June 2010. The major shareholders of NDB are BOC (9.9%), EPF (9.7%), Sohli Captain (8%), Sri Lanka Insurance via General and Life Fund (10.4%), Dr. Sena Yaddehige (5%) and ETF (3.4%). Deputy Chairman Ashok Pathirage controls around 4 million shares or 5% stake. In a major blow to NDB, the bank also announced the resignation of professional banker Rajendra Theagarajah as CEO/Director with effect from 30 November 2016. In July this year he completed three years of service as a Director/CEO, having accepted a contract for a five-year tenure from August 2013. However, he told NDB management and staff last week that upon reaching the age of 58, he had decided to step down. “Having led the NDB management team and the bank for three years I believe it is time to spend more time with my family and pursue wider interests,” Theagarajah said in an internal note to NDB management and staff. Some analysts speculated Theagarajah to be given a Government job though there was no confirmation. Though leaving the bank and cutting short his contract, Theagarajah said the NDB management team had a good blend of experienced and qualified personnel and he was confident that the team would work well together and support the next CEO of the bank. “While being relatively modest in size and scale in comparison to some of its peers, I believe this bank (NDB) has the agility and energy to differentiate itself from its peers and compete aggressively in the coming years,” said Theagarajaha in his note. Prior to joining NDB, he was the longstanding CEO/MD of Hatton National Bank. He also said he was leaving with tremendous respect for NDB and his fellow staff members. He has promised that he will ensure an orderly handover of his responsibilities to his successor, who will be identified by the Board. He also expressed confidence that the management and staff will extend their fullest cooperation to his successor and the leadership team in leading NDB to greater heights in the years to come. Atukorala possesses extensive experience in banking, extending over 35 years, having been with the ANZ Grindlays Banking Group both in Sri Lanka and overseas and having served as Deputy General Manager of ANZ Grindlays Bank, Sri Lanka, Sri Lankan Country Manager of Mashreq Bank PSC and Director of Union Bank Plc and DFCC Bank Plc. He was also a former advisor to the Ministry of Policy Development and Implementation. At present he serves as an Independent Non-Executive Director in the following listed entities - United Motors Lanka Plc, Orient Finance Plc and Colombo City Holdings Plc. He also serves as the Non-Executive Deputy Chairman of UB Finance Company Ltd. and as an Independent Non-Executive Director of Pragnya Tech Parks Lanka Ltd, TVS Lanka Ltd, Unimo Enterprises Ltd., Arni Holdings & Investments Ltd. and Unawatuna Boutqieue Resort Ltd.
Atukorala has also served as a Member of the Technology Initiative for the private sector, an USAID-sponsored project with the Ministry of Industrial Development, a Member of the Commercial Banking Sector of the Presidential Commission on Finance and Banking and as a Committee Member of the Banker’s Club of Sri Lanka. He was a former Director of the Sri Lanka Banks Association (Guarantee) Ltd. and the Credit Information Bureau of Si Lanka (CRIB). He holds a BSc (University of Leeds, UK), MTT (North Carolina State University, USA) and a MBA.